We also provide Portable Appliance Testing (PAT) services. 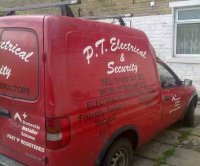 If you need reliable, punctual and honest service then count on PT Electrical and Security. Our City & Guilds qualified NICEIC electrical contractors and PAT Testing technicians are dedicated to giving you the best in electrical installations and testing services available in the areas of West Yorkshire and Halifax. As a small, family run business we can guarantee that you will get a personal service and that all your needs will be taken care of. Whether you require burglar alarms, rewiring CCTV or PAT Testing services we will make sure that the end results of our work match your exact specifications. With over 20 years of experience in the industry, you know you will be in good hands with our NICEIC electrical contractors. We are also insurance industry approved, for your peace of mind. Customer satisfaction, from the smallest, to the largest of jobs is of utmost importance for us. Call us today and find out what we can do for you. For more information or a free quotation, please visit our contact page on our website. We are a small, well established electrical company that prides ourself on high standards of workmanship at competetive rates. We work in and around the Halifax / Calderdale area, but are willing to travel anywhere in the UK for medium to large jobs. 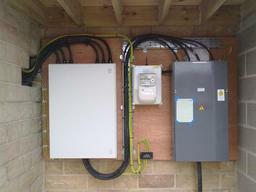 i.e rewires, large Burglar alarm and CCTV systems. Trade Bodies / Associations NICEIC Domestic Installers. Specialist Services All types of Electrical Installations and repairs, Portable Appliance Testing Services, Burglar Alarms, CCTV Systems.